The Žugelj household at Zilje 18 is named according to the surname of the family that lived there for many generations. There is evidence of an inheritance of a vinyard by a Mikula Žugelj upon the death of Kristof Purgstall in 1587, then owner of Pobrežje Castle. This coincides nicely with oral tradition: a Žugelj was bequeathed land in Zilje by his employer, the count of the Pobrežje Castle near Adlešiči. This Žugelj was a gardener for the Count, and this part of the story is supported by the arrangement of fruit trees around the Žugelj household. Other households in Zilje had fruit trees planted sporadically around the house, but at the Žuglji they are arranged in rows, as they would be if planted by someone who was a gardener by trade. The oldest record we have for a person living here is for Nikolaj Žugelj, who was likely not born in Zilje, but most likely in Dobravice (near Metlika) in ca. 1728. The surname remained Žugelj until the early 1900s, and the household was sold by the family in the mid 1900s. 1A. Jurij Žugelj m. 1774 to Barbara Starešinič (Pečova) — they remained at this house. 1B. Marko Žugelj b. ca. 1773, m. 1793 to Doroteja Balkovec (Balkovci) — they remained at this house. 1C. Barbara Žugelj b. ca. 1781, m. 1801 to Johan Balkovec (Vidarov from Balkovci). 1D. Johan Žugelj b. 1788, m. 1809 to Ana Jaketič (Šoštarova) — they remained at this house. 1C. Ana Žugelj b. 1792. At this time, it is unknown what happened to her afterwards. 2A. Johan Žugelj b. 1781. At this time, it is unknown what happened to him afterwards. 2B. Jurij Žugelj b. 1784. At this time, it is unknown what happened to him afterwards. 2C. Nikolaj Žugelj b. 1785. At this time, it is unknown what happened to him afterwards. 2D. Katarina Žugelj b. 1795, m. 1815 to Marko Joh (Johi). 2E. Helena Žugelj b. 1799. At this time, it is unknown what happened to her afterwards. 2F. Barbara Žugelj b. 1810, had 3 illegitimate children. 2G. Margareta Žugelj b. 1815. At this time, it is unknown what happened to her afterwards. 2H. Johan Žugelj b. 1813, m. 1837 to Marija Starešinič (Matečeva from Preloka) — they remained at this house. 2I. Ana Žugelj b. 1816, m. 1837 to Miha Ivanovič (Pavlinskev from Pavlini). 2J. Jurij Žugelj b. 1819. At this time, it is unknown what happened to him afterwards. 2K. Marija Žugelj b. 1830, m. 1852 to Johan Tahija (Glavica 3). 3A. Barbara Žugelj b. 1846, died at the age of 69. At this time, it is unknown if she was ever married or had children. 3B. Jože Žugelj b. 1838, m. 1863 to Katarina Žalec (Brdarova)1 — they remained at this house. 3C. Ana Žugelj b. 1840, m. 1863 to Peter Žalec (Brdarov)1. 3D. Barbara Žugelj b. 1843, m. 1871 to Marko Balkovec (Dolnji Baljkovski from Balkovci). 3E. Nikolaj Žugelj b. 1849, m. 1885 to Ana Čemas (Peričina) — they lived at Zilje 9. 3F. Marija Žugelj b. 1852, m. 1874 to Peter Starešinič (Špeličev). 3G. Magdalena Žugelj b. 1859, m. 1880 to Miha Starešinič (Čemaskin from Preloka). 1. Peter Žalec and Katarina Žalec were siblings. Jože Žugelj [3B] and his wife Katarina Žalec had 2 children which died in infancy. Jože Žugelj [3B] m. 1866 to his second wife Helena Čemas (Majiščarka). Together they had 4 children which died in infancy. Jože Žugelj [3B] had 3 illegitimate children with Helena Cvetaš during his marriage to Helena Čemas which died in infancy. 4A. Marija Žugelj b. 1877, m. 1897 to Jože Žunič (Karocin from Žuniči). 4B. Matija Žugelj b. 1879, m. 1905 to Barbara Cvetaš (Dolnja Cvetaševa) — they remained at this house. 4C. Peter Žugelj b. 1883, m. 1905 in Pittsburgh, Pennsylvania to Katarina Pavlaković (Krznarova from Vukova Gorica) — they lived at Podklanec 4. 4D. Barbara Žugelj b. 1889, m. ca. 1907 in Pittsburgh, Pennsylvania to Franc Gašparič (Gašparičev from Hrast) — they remained in the United States. 4E. Katarina Žugelj b. 1891, m. in Pittsburgh, Pennsylvania to Franc Plantan — they remained in the United States. 4F. Magdalena Žugelj b. 1893, m. ca. 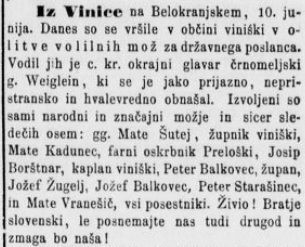 1913 in Pittsburgh, Pennsylvania to Jože Vidina (Izpodruškin from Vidine) — they remained in the United States. 4G. Miha Žugelj b. 1895, m. in Pittsburgh, Pennsylvania to Franca Starešinič (Mežnarova from Preloka) — they remained in the United States. Jože Žugelj [3C] was likely more educated than the average person living in Zilje, since his father was, apparently, a teacher. In this article from the June 17th, 1879 edition of the Slovenec newspaper, we see that Jože Žugelj [3C] was one of eight selected to elect a national representative to the Austrian House of Deputies (Abgeordnetenhaus). Only men 25 years or older who paid a set minimum in property taxes would be allowed to vote (approximately 6% of the population). Jože Žugelj [3C], according to oral tradition, also had a tavern at the Žuglji, where he would also forcibly detain individuals who could not pay. It seems he was a person who wielded a relatively good amount of power in town, his two illegitimate children were recorded as legitimate in the church records. He was also likely an alcoholic, which resulted in surmounting indebtedness. By the time Jože [3C] died in 1897, he had lost ownership of the family farm. As a result, Matija Žugelj [4B] did not inherit any land. In order to buy the land back from creditors, he began to travel to the USA in 1896, and worked in Pittsburgh on and off for many years, saving up money to buy back the family farm. 5A. Marija Žugelj b. 1907, m. 1926 to Ivan Langer (Brezovina 32). 5B. Barbara Žugelj b. 1914, m. 1930 to Stanislav Čemas (Dolnji Brožičev) — they remained at this house. 5C. Frank Gaspar b. 1908. At this time, it is unknown what happened to him afterwards. 5D. John Gaspar b. 1913. At this time, it is unknown what happened to him afterwards.